I am monitoring the risk of frost next FRI or SAT morning. The NAM model future-cast radar shows a couple of storm chances this weekend. Tomorrow: Yes. Monitor updates Saturday night/Sunday. A few storms could be intense with hail and high winds. Lightning. I am closely monitoring the tornado risk on Sunday. Is lightning in the forecast? Yes. Lightning will likely occur Saturday night and Sunday. Is severe weather in the forecast? Yes. I am monitoring Saturday night and Sunday for strong to severe storms. Hail and high winds would be the primary concern. There may be a tornado risk on Sunday. Confidence on the tornado risk, at this time, is low. Monitor updates. Is Flash flooding in the forecast? Monitor. Locally heavy rain is possible Saturday night into Sunday night. If thunderstorms train over the same areas then localized flooding could occur. General river flooding will continue. Is lightning in the forecast? Yes. Lightning is possible on Monday. Lightning is again possible on Thursday and Thursday night. Is severe weather in the forecast? Possible. I am watching Monday. Some strong storms are possible on Wednesday night into Thursday afternoon. The timing of that system will need to be worked out. There are also questions about whether quality moisture can push far enough north to produce thunderstorms. Monitor updates. Friday’s Forecast: Morning fog mixing out. Mostly cloudy during the morning. Small chance of patchy drizzle. A few patches of sunshine may develop as the day wears on. Plan on clouds. High temperatures on Friday will be partly dependent on cloud cover. Keep this in mind. Wind direction and speed: Variable wind 5 to 10 mph. Coverage of precipitation: None. Small chance of patchy drizzle. Friday night Forecast: Evening clouds. Some clearing overnight. Wind direction and speed: Winds becoming northeast and eventually east at 4 to 8 mph. Sunday’s Forecast: Windy. Warm. A mix of sun and clouds. Scattered showers and thunderstorms. Locally heavy rain is possible. A few storms could be severe. There remain questions about instability and coverage on Sunday. Clouds and rain/storms may keep instability down. 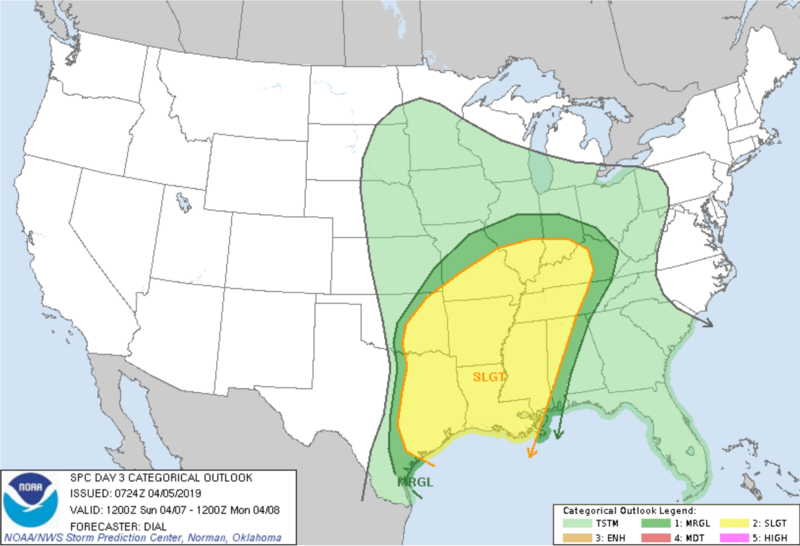 If that occurs then the severe weather risk will be minimal. If we do have some sunshine then the risk of severe storms will increase. Sunday night Forecast: Cloudy with scattered showers and thunderstorms. Locally heavy rain is possible. Some storms could be severe. Monitor updates. 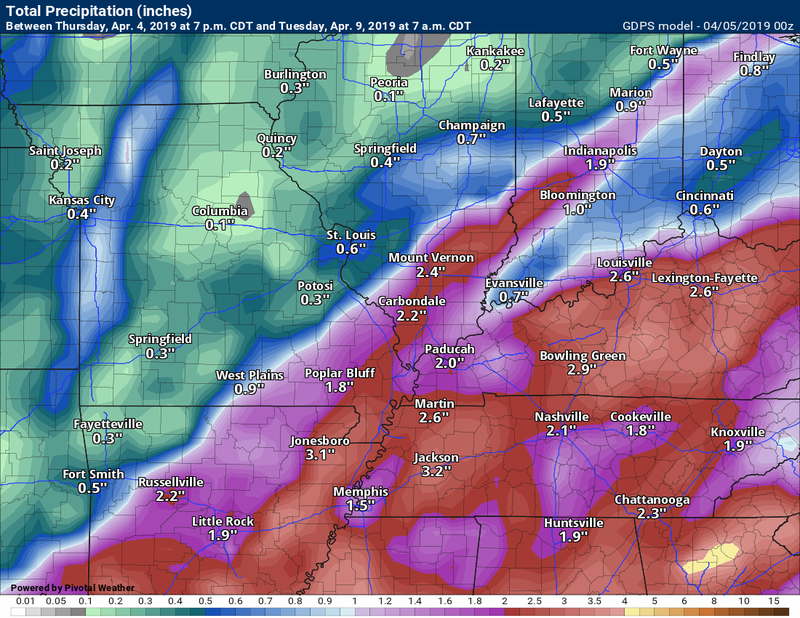 There are some questions about precipitation coverage on Sunday night. Monday: Cloudy. A chance of scattered showers and thunderstorms. Mild. Highs in the upper 60’s to lower 70’s. 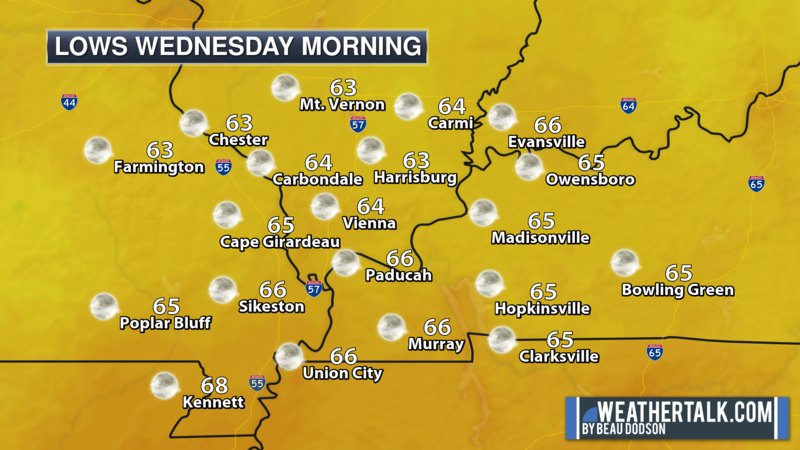 Lows in the lower 50’s. North and northwest winds at 7 to 14 mph. 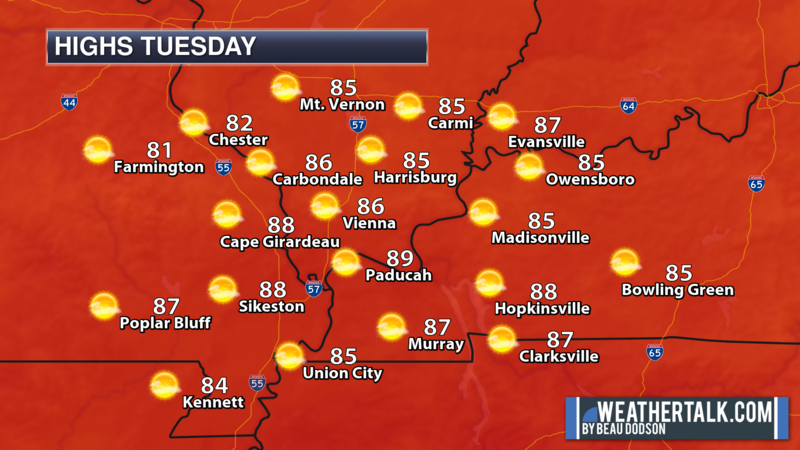 Wednesday: Partly sunny. Warm. Windy. A chance of a thunderstorm Wednesday night. Highs in the middle 70’s. 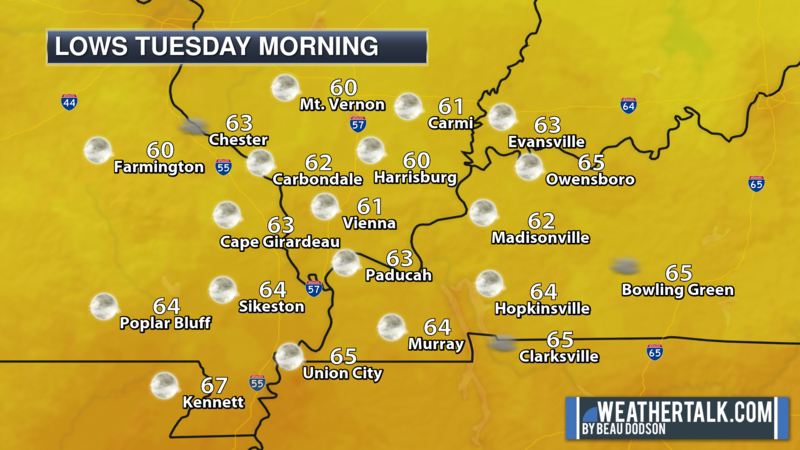 Lows in the middle to upper 60’s. Southerly winds at 15 to 25 mph and gusty. Today and tomorrow: I am monitoring late Saturday night for strong to possibly severe thunderstorms. Hail and high winds would be the main concern. Lightning and heavy downpours. Sunday through Thursday: Thunderstorms will be possible on Sunday and Sunday night. Some storms could be severe. Monitor updates. There remain questions about instability. How unstable will the atmosphere become on Sunday? That will depend on clouds and rain. Let’s pay attention this weekend. 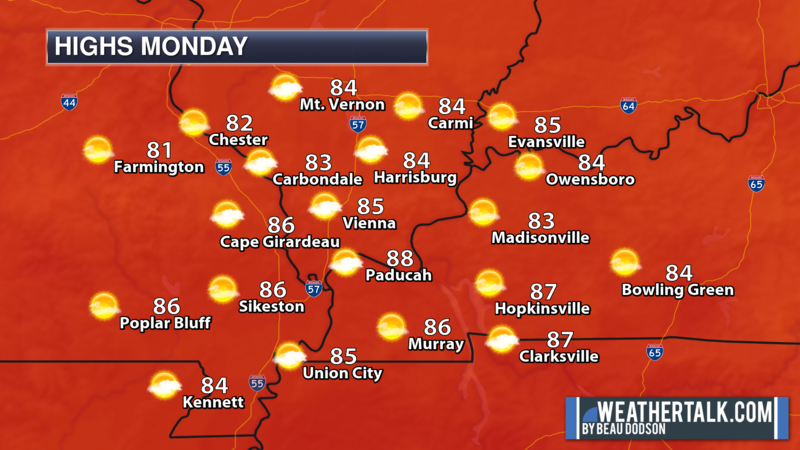 A few thunderstorms may linger into Monday. I am also watching next Wednesday night into Thursday afternoon. Thunderstorms will be possible, as well. 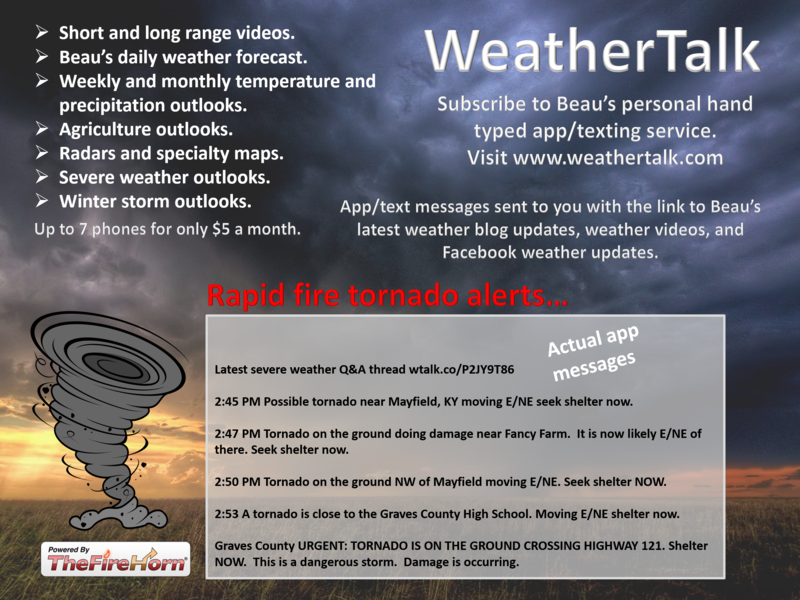 The above graphics are from NOAA. Let’s look at the models. These maps show rainfall totals through Monday afternoon. Mild weather today into the middle of next week. Thunderstorms will be in the forecast Saturday night into Monday. Some storms could become severe. Another round of showers and thunderstorms will be possible Wednesday night into Thursday. Monitor updates. 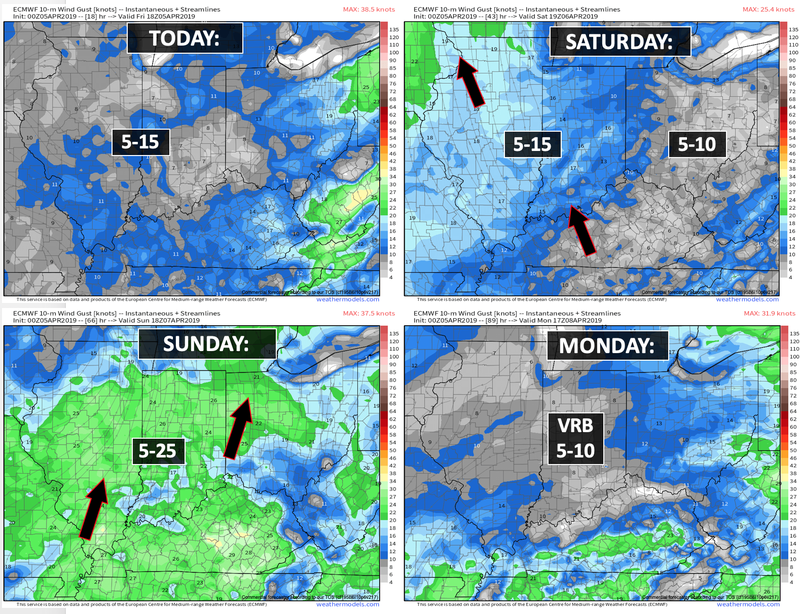 I ramped up the wording on both Saturday night into Sunday night’s severe weather concerns. I added locally heavy rain to the weekend forecast, as well. I added thunderstorms to the Monday forecast. Yes. Monitor the risk of severe weather Saturday night into Sunday night. Thursday’s rain event weakened as it moved east. Why? A thunderstorm complex along the Gulf of Mexico robber us of moisture. 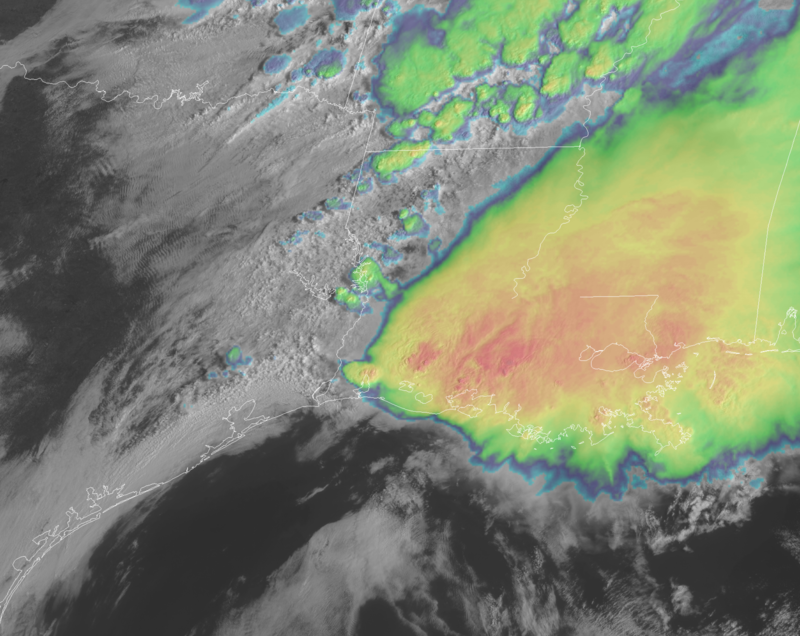 If a thunderstorm complex forms in Louisiana and Mississippi then it helps to block the transport of more moisture northward. You can see that complex on this satellite image from yesterday. This is the visible satellite with IR overlayed. Those reds are tall thunderstorms. 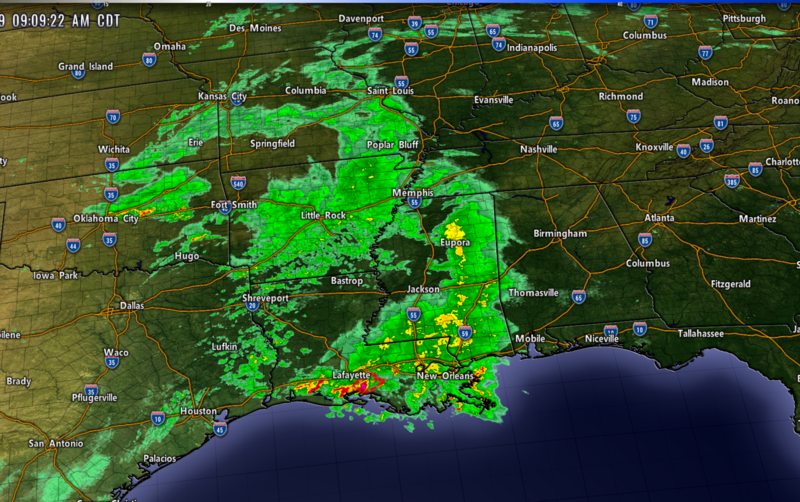 Numerous showers and thunderstorms to our south. Dry weather today into Saturday afternoon. Mild, as well. Clouds will linger today and that will shave a few degrees off the high temperatures. It will still be mild. We may also deal with some clouds on Saturday. 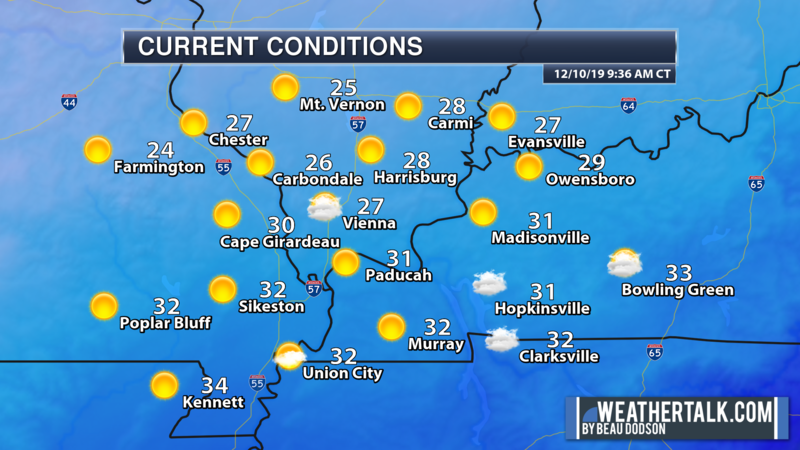 Hopefully, the inversion will mix out and allow the sun to shine. Temperatures on Saturday and perhaps Sunday will climb into the upper 60’s to middle 70’s area-wide. Even warmer where sunshine occurs. It should feel nice out. Southerly winds will become a bit gustier by Saturday afternoon and evening. That will be a signal of changing weather conditions. Clouds will thicken as we move into Saturday afternoon and evening, as well. 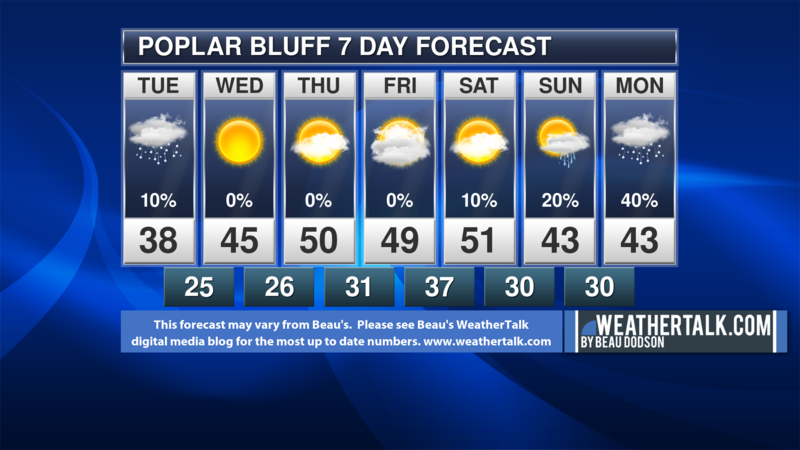 There is a small chance that a shower or thundershower will creep into southeast Missouri late Saturday afternoon. Saturday night into Sunday night. Shower and thunderstorm chances ramp up considerably Saturday night and Sunday. Sunday night, as well. Some locally heavy downpours are likely. The atmosphere will be unstable enough Saturday night to place thunderstorms in the forecast. A few of those storms could be intense with strong winds and even hail. Monitor updates. Clouds and rain may help keep the atmosphere from becoming too unstable on Sunday. If that happens, then the risk of severe weather will not be all that great. This remains a question. If the atmosphere does become unstable then severe weather is likely to occur Sunday and Sunday night. 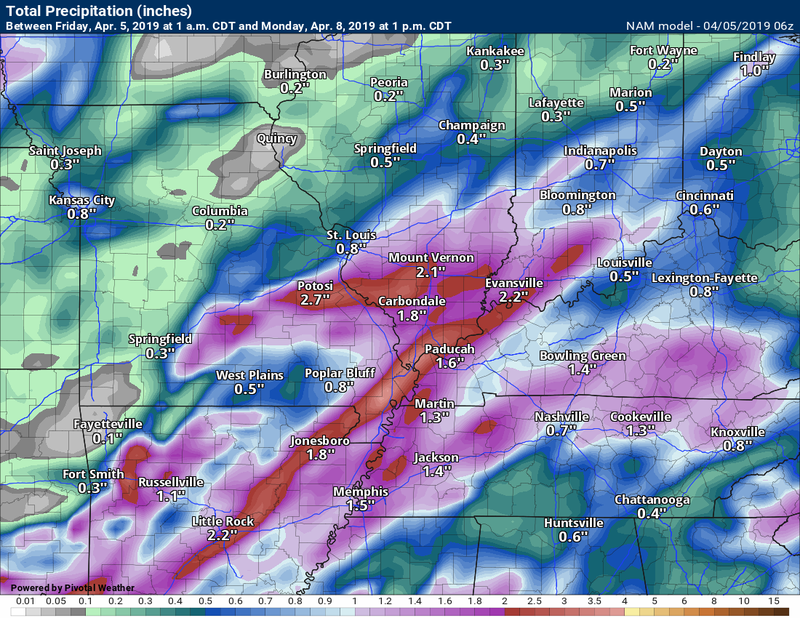 Rainfall totals of 0.75″ to 1.50″ will be possible Saturday night through Monday. Higher totals are likely where thunderstorms occur. 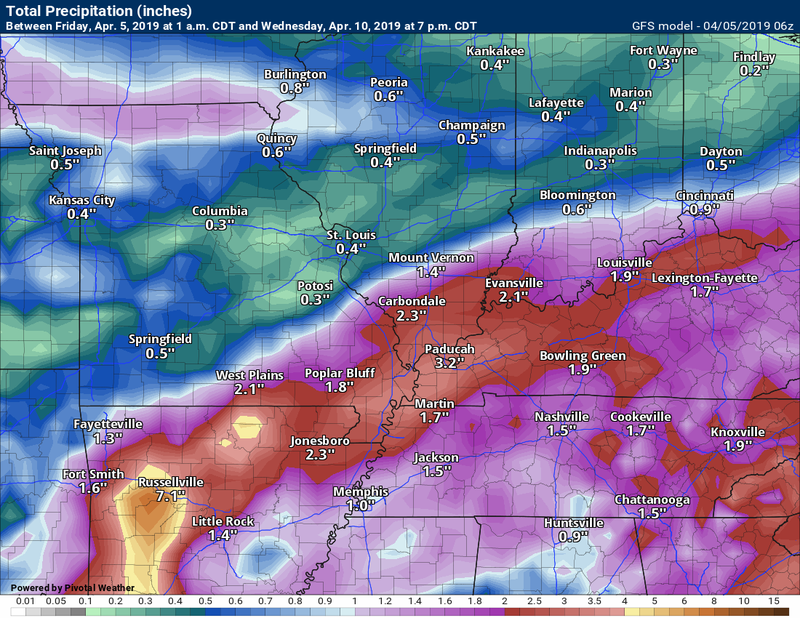 Some locations could top two inches of rain. Sunday will also deliver gusty southerly winds. Gusts will top 25 mph. Let me show you a few charts for this coming weekend. The Storm Prediction Center has outlined our region in a risk of severe thunderstorms both Saturday night and Sunday/Sunday night. The Saturday night risk will likely be hail and perhaps strong winds. This would likely hold off until after midnight. Do not get hung up on the colors. 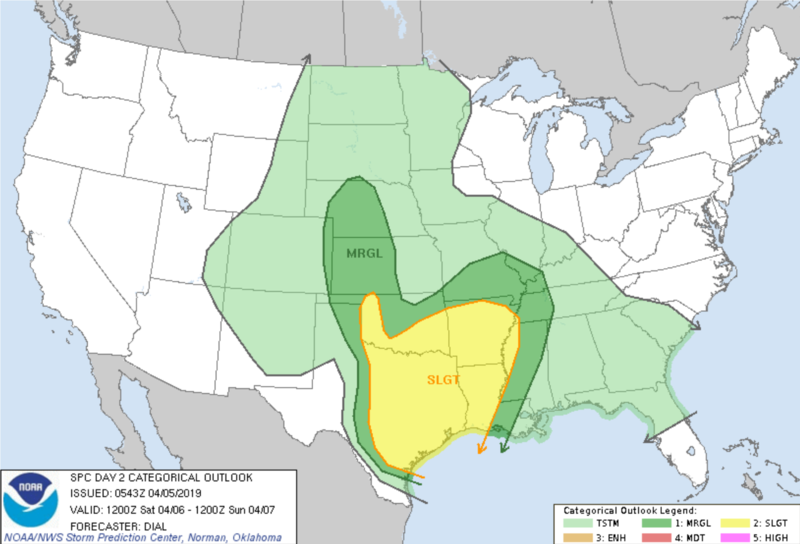 Anyone in the dark green to yellow will have a risk of severe weather. This maps will likely change with future updates. 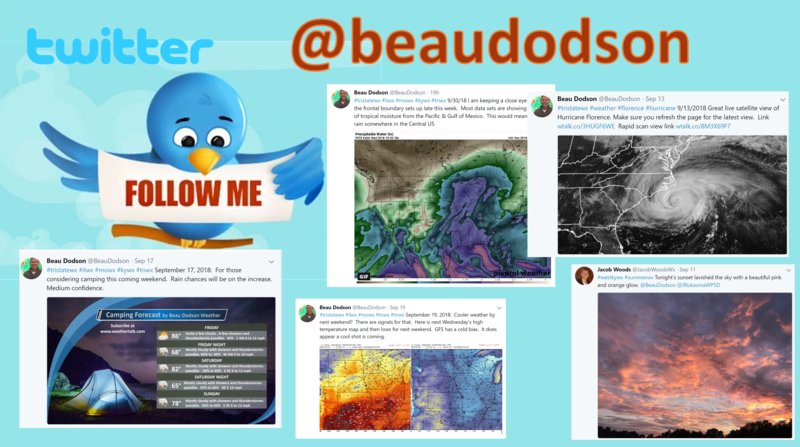 Follow the forecast and not the colors. Dew points are a measure of moisture. I typically look for 58 degrees and above when considering strong thunderstorms. PWAT values. 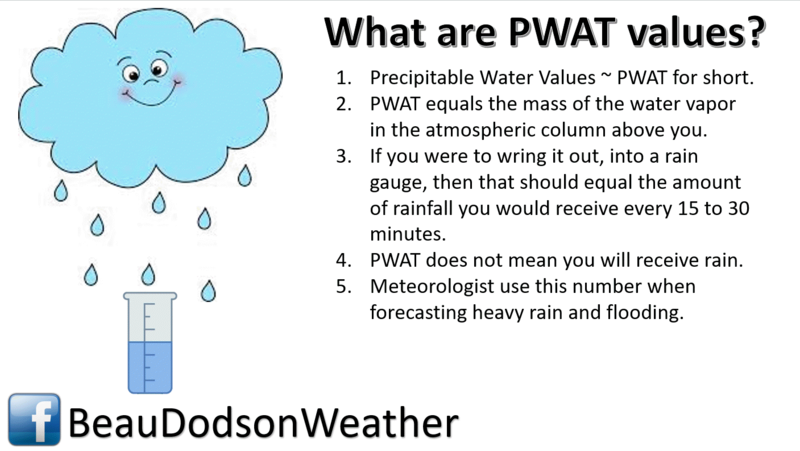 PWAT is a good indicator of locally heavy rain. We will have an extended period of above normal PWAT values. I am monitoring the chance of Thunderstorms on Monday, as well. There could still be some instability in the area. Yet another storm system will push into the region by Wednesday night into Thursday evening. Showers and thunderstorms may develop along the cold front. 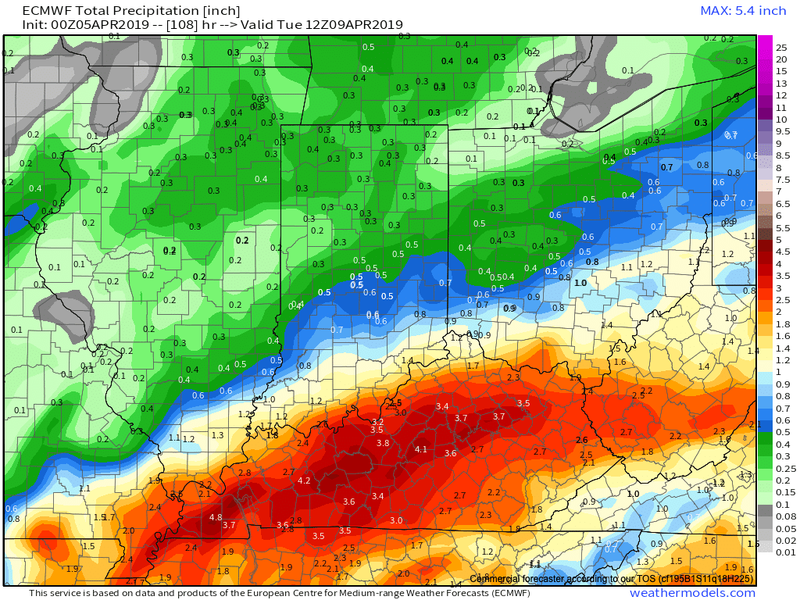 There is some question about moisture return from the Gulf of Mexico with this system. Sometimes these fronts can’t tap into enough moisture. When that happens, the fronts move through our region with little or no thunderstorm activity. 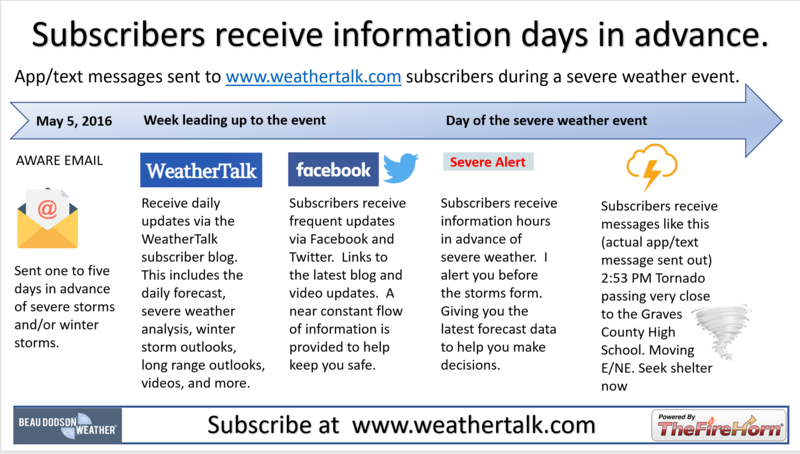 It is a bit early to know if severe weather will be a concern. This is a strong storm system. A winter storm is likely on the north side of the low. Rain and storms in the warm sector. See future-cast radars below. Strong and gusty gradient winds (because of tight barometric pressure readings) will be a concern, as well. Those would most likely by Wednesday night into Friday morning. This storm system is still several days away. Monitor updates. .It will turn cooler behind the system. Another chance of showers and thunderstorms will enter the region by Saturday night and Sunday. The rain will linger into Monday. Some locally heavy rain will be possible where thunderstorms occur. A few storms could be intense Saturday night into Sunday night. Let’s take a look at some future-cast radar images for Saturday night into Monday. Time-stamp upper left. This only goes out to 1 PM on Sunday. Additional storms are possible after that time. Here is the other NAM model. It goes out further in time. Looking beyond the weekend system, we see another chance of showers and thunderstorms next Wednesday night into Thursday. Here is the GFS future-cast radar for the Wednesday night/Thursday event. Notice it has the front moving through our region without much in the way of shower and storm activity. This remains a question. Notice the heavy snow (blue) on the north side of the low. Looking beyond the weekend system, we see another chance of showers and thunderstorms next Thursday or Friday. If dew points rise then we could have some locally heavy storms. 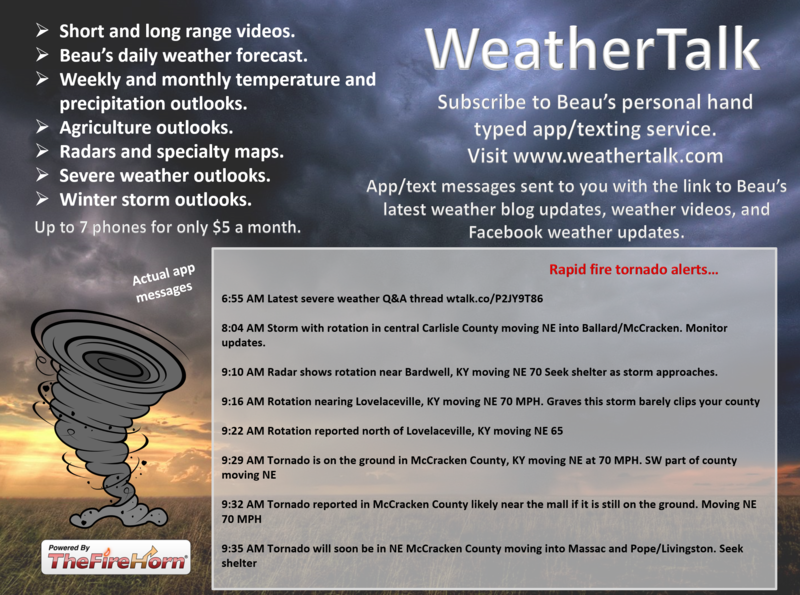 A bit early to make a call on severe weather. This is the system that I am monitoring. You can see on the GFS where above normal temperatures occur ahead of the system and then cooler behind it. Red is above and blue is below normal temperatures. Remember, low pressure rotates counter-clockwise. That means that a low passing to our northwest would pull warmer air into our region. Then, as the system passes, cooler air arrives behind it.